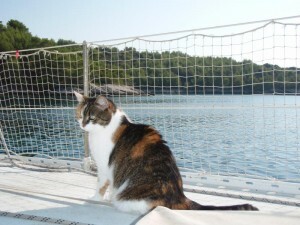 Pitufa’s crew consists of Birgit, Christian and Leeloo, the ship’s cat. 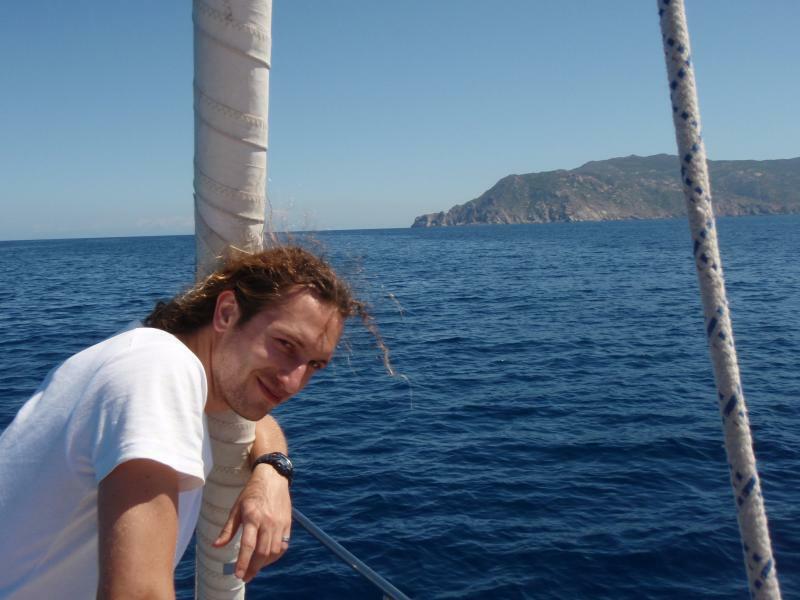 When we first set out sailing towards the horizon aboard Pitufa, we were surprised to discover more crew members on board. The first one to mention is our untiring helmsman Wayne Vaney (the hydrovane wind pilot), who holds a steady course through night, rain and storm. Also worth mentioning, despite his smelly and sometimes explosive nature, Berti the Bertschi kerosene oven is an indispensable partner in the galley. 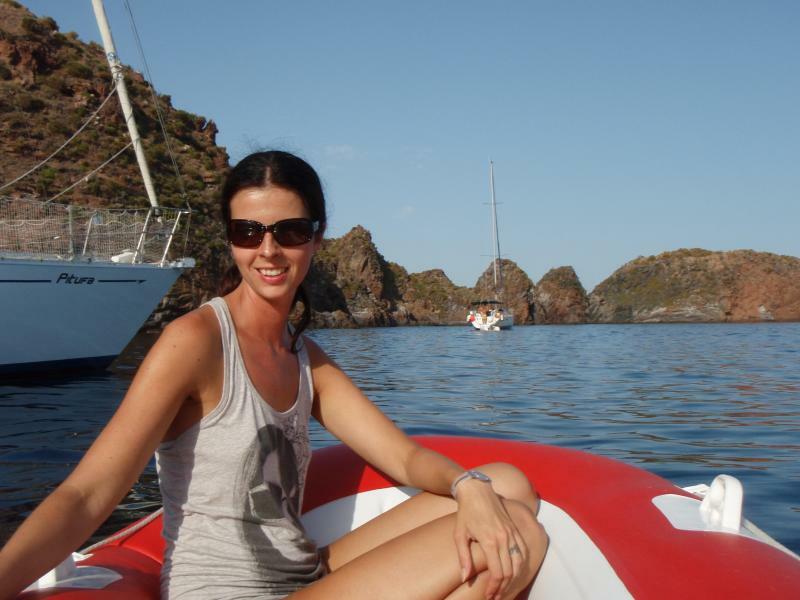 Birgit Hackl (born in 1978 in Linz, Austria) took her first steps on her parent’s small motorboat in the summer of ’79. During her childhood she always spent her summer holidays on boats, first on Lago di Garda and later on the Adriatic sea. Her love for the sea, for boats and the freedom they bring, originates from that time. Christian Feldbauer (born in 1976 in Grieskirchen, Austria) had a predominately dry, or at least boat-free childhood. As a teenager he was already interested in technical stuff and accordingly chose an education and career as an engineer. Thus he acquired technical knowledge and skills that would later on prove to be very useful while repairing and upgrading a second-hand yacht. In 1995 we got to know and love each other, moved to Graz (in the south of Austria) to study and discovered many leisure activities and interests together: motorbikes, diving and getting to know foreign (and preferably “exotic”) cultures as backpackers. In 2000 Leeloo the cat joined the family, accompanied us to Sweden in 2006 and later on to England, and spontaneously turned into a ship’s cat when a new centre of interest started to dominate our lives in 2008: sailing. Even though she enjoys spending time in the garden catching mice, she adjusts easily to living on a boat, as the most important thing for her is having us around 24 hours a day. Particularly night watches are fun for her. We had never been particularly interested in sailing as a sport and never even been on a sailing yacht (apart from Christian’s one week sailing course on a lake in the Austrian Alps while still at high school) when it suddenly occurred to us – while (illegally) drinking beer on a beach in Hawaii – that so many islands were out there on the ocean, only waiting to be discovered. Especially sparsely populated, exotic islands without other tourists were of particular interest. On the other hand these islands tend to have the disadvantage of being rather inaccessible (hence the desired lack of tourists), but a solution for this problem was found quickly: a sailing boat. After the return to rainy England, the idea slowly turned into an obsession. The shelves of our flat started filling up with literature on sailing and only two years later we found the ideal blue water yacht, bought her and then set out to sail her from Mallorca, Spain, to her new harbour in Pula, Croatia – it was our very first sailing trip, just the two of us and (of course) Leeloo. During these three weeks we started converting our theoretical knowledge into practical seamanship. Due to the lack of time there was little time for rest. We experienced the daily routine on a cruising yacht, went through a storm, faced the tiring night watches and some technical problems. But when we arrived after three weeks, the decision had been made: we would leave secure little Austria – at least temporarily – and sail around the world aboard Pitufa. Christian had studied electrical engineering at Graz University of Technology (TUG) and worked after his PhD as an assistant professor at the Signal Processing and Speech Communication Lab at TUG. The end of the contract with the university in February 2011 seemed like the right time to start a new chapter of life. Birgit worked as a language trainer for adults with various institutions after studying Spanish, History, English and German as a foreign language at Karl-Franzens University Graz. This highly flexible job would probably prove useful to fill up the cruising kitty, or at least the language skills should help when dealing with bureaucratic port authorities. Do I envy you? – You are setting out to do, what I have always dreamed about, but never had the courage to do in younger years. I had two boats so far, but they never left the Mediterranean Sea. BTW, I discovered your page perusing Dylan’s Google group – as we share another interest: WordPress and Geo Mashup. The palm trees are a custom placemark icon in a kmz file. The kml/kmz files are loaded in my custom.js (using gmap api) for geo mashup. For any static map content I recommend using kml/kmz files. The boat is a custom placemark icon for a particular wordpress category. This one is set by adding a ‘categoryIcon’ action in custom.js. Zwei Jahre ab durch die Mitte. Mit Atlantiküberquerung und einen wilden Schlenker im Pazifik – Respekt. Ich wünsche Euch eine feine Zeit. freut mich von dir zu hoeren. ja, so machen wir das. wobei die angesprochenen 2 Jahre halt einmal die ersten 2 Jahre sind… Wir sind heute auf den Kapverden angekommen. Jackie and Graham , we met you in Melilla. we still haven’t finished reading your books Remember how nervous we were before venturing out on the Atlantic? It’s just like you said, the swell is longer and higher, the systems are bigger than in the Med, but we enjoy the constant winds here, sailing isn’t as annoying as with the fickle winds in the Med. Where are you now? Back in the UK or in France? Hey Christian and Birgit…..you became our heroes overnight once we discovered your blog. Senait and Me spent hours navigating through your galleries. You are truly the Columbus of our time, We wish you great sail and all the best……keep on posting so that we know where you are on the map. schick euch mal eine kurze nachricht aus good old vienna, austria. wo seid´s ihr momentan unterwegs? Heute noch einkaufen in Paramaribo, morgen fahren wir weiter in die Fluesse rein. Alles Gute und viel Spaß im Neuen Jahr! Katamaran Thalassa nun seit fuenf Jahren im Pacifik herum. Fuer 2016 ist ein Toern New Zealand- Polynesia geplant. Erfreut habe ich Euren Bericht ueber die Gambier Islands gelesen. Endlich wieder einmal eine Darstellungsform, die abgehoben von dem sonstigen Lapidaren auch verwendbare Informationen anbietet. Vielleicht koennt Ihr mir auf meine Bitte hin genauere Bestell- Angaben zu den von Euch verwendeten Garmin-Karten machen. notwendig um dem betreffenden Amerikaner, man glaubt es kaum, geographisch klar zu machen wo der Suedpazifik liegt. Ist Home Port Base Camp vorzuziehen?